A long-standing debate amongst wine pros and wine glass manufacturers has been whether and when size matters. A group of researchers at the Tokyo Medical and Dental University decided to take up the subject so they would become the “busters” or “truthers” as to whether wineglass size has any effect upon the taste of the wine. First, before raising our glasses and getting into arm wrestle position, a few guidelines: The scientific researchers used different glass shapes as well as sizes, including a Martini glass and a straight tumbler – and heated them to different temperatures. Then, now here’s the geeky part, in order to measure the vapors emanating from the glasses, the researchers impregnated a mesh with the enzyme, alcohol oxidase, which converts low molecular weight alcohols and oxygen into aldehydes and hydrogen peroxide. Added onto the mesh were luminol and (stay with me, now) horseradish peroxidase, which creates a bright luminescence and color change when combined with hydrogen peroxide. It seems this combo of chemicals intensifies the coloration, making it easier to “see” the vapors with a special camera. Any of us that watch the show, “CSI”, will see this process in each episode as part of how they crack a case! Now, the fun part. At 55° F / 13° C, the alcohol concentration in the center of the WINE glass was lower than that around the rim. When wine was served at a higher temperature, or from either the MARTINI glass or TUMBLER, there was no ring-shaped pattern visible. This “ring phenomenon” (be sure and click to see the video!) 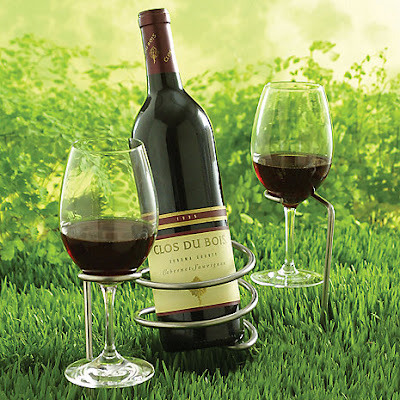 allows us to enjoy the wine’s aroma without interference from the gaseous ethanol. “…accordingly, wine glass shape has a very sophisticated functional design for tasting and enjoying wine,” explains Kohji Mitsubayashi, the lead scientist on the project. Graphic shows surface area of wine, aroma lifting and thin gauge of wine glass. Additionally, the larger the wine glass and the thinner the gauge of the glass contribute to the aroma and bouquet qualities that wine lovers chase. Proving this is when size and shape matter. Here’s a DIY for amazing yourself and friends. First, privately, pour about 3″ to 4” of wine into a variety of 3 or 4 glasses, say a wine glass from Riedel, a mason jar, a Martini glass, a heavy-rimmed, thick wine goblet, etc. You’re looking for size, shape and thickness differences. Tell your friends that you have several wines you want them to taste blindfolded. Now blindfold one person at a time and mix up the order of the glasses and then help them to smell and sip a bit of the wine. Be careful not to allow them to touch the glass to try and determine what its size/shape may be. Mark down their reaction to each vessel. It will be hard to keep everyone’s reaction silent, but worth the effort. Amazingly, each time, the “blind taster” will select the wine from the appropriate tulip-shaped, thinnest glass as their favorite. Then you can tell them it was all the same wine. Case closed. Conclusion: Size does matter, as does shape. Follow my MyLALifestyle and stay connected. Photo credits: Courtesy Winefolio, Alamy.com, Courtesy Wine Folly, Courtesy Guardian UK. Next articleNo more blank canvas!